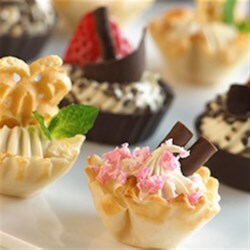 "Cute mini phyllo pastry shells are filled with a fluffy combination of lemon curd, cream cheese, and whipped cream to make elegant treats all ready for you to decorate as you please." Whip cream in small bowl until it holds stiff peaks. Stir together curd and cream cheese in separate bowl until smooth. Fold whipped cream into curd mixture. Pipe or spoon mixture into shells. Top with your favorite garnish. Refrigerate until serving. This was very tasty!! I put some seedless blackberry ja in the bottom of some small cookie tart shells then the Creme Curd with raspberries on top.